LondonPropertyGuru present this four bedroom penthouse onto the sales market. Set over two floors it is located right on the River Thames. The first floor of this stunning penthouse comprises of four en-suite bedroom, a huge reception/dining room, kitchen area and two terraces. This floor provides the main living areas of the apartment. With the second floor having a swimming pool/pool room and gym. On this floor we also have a massage/changing room, sauna, steam room, staff room and utility room, as well as another huge terrace. With its indoor swimming pool that looks out onto the Thames, you will be hard pressed to find anything like this in London. To register your interest and view this stunning penthouse, please call the sales team on . As you enter this grand and sleek entrance hall, you are greeted by beautiful gloss wooden flooring and brilliant white walls. From here you a lead through to the rest of this stunning apartment. To the left of the entrance hall we have the apartments main kitchen area. Perfectly designed with a island in the middle of the room and fully integrated appliances. Finished with the highest quality materials, the dark wooden floor is in perfect contrast to the high gloss white cupboards, we also have an incredibly unique mirrored ceiling. The main show piece of the apartment is the grand reception and dining room. With large floor to ceiling windows and terrace area, the whole room is completely filled with natural light. Finished with the same stunning wooden flooring as the rest of the apartment, we also have brilliant white furniture to add that stylish and luxury feel to this already phenomenal space. The master bedroom boasts fantastic full length sliding glass doors that lead out on to one of the apartments many terrace areas. Inside we have a sleek and stylish bedroom, with built in wardrobes and additional storage. Mood lighting surrounds the edges of the ceiling, giving this room an atmospheric and ambient feel. The master bedroom is finished off with a large luxury en-suite bathroom, with a unique finish it comprises of a shower, separate bath and twin sinks. Bedroom two has the same high quality finish as the master suite, as well as its own en-suite bathroom and built in wardrobes. Each bedroom is situated along side terrace, which ensures that their floor to ceiling windows have an uninterrupted views outside and allow light into the room with no interruption. Bedroom three, similar to the second bedroom in both size and finish also benefits from its own en-suite, storage and again is flooded with light from its floor to ceiling windows. Bedroom four has much more floor space than the two previous bedrooms. Benefitting from being on the corner of the apartment it has large windows on two sides of the room, with full length sliding doors that leads out on to the back section of the terrace. Again with its own en-suite bathroom, comprising of shower, separate bath and basin area, it is finished with high quality tilling on both the walls and the floor. The first terrace is accessed via the show piece reception/dining room. With glass sliding doors, the terrace becomes part of the room, giving access to the fantastic views that can be seen from here. The main section of terrace two is located on the river front. Accessed from the master bedroom, we have a large seating area with patio flooring that wraps around the entire side of the apartment that bring you round to the rear. Terrace three is located at the rear of the apartment, and can be accessed from either the walk way from terrace two or from the sliding glass doors from bedroom four. 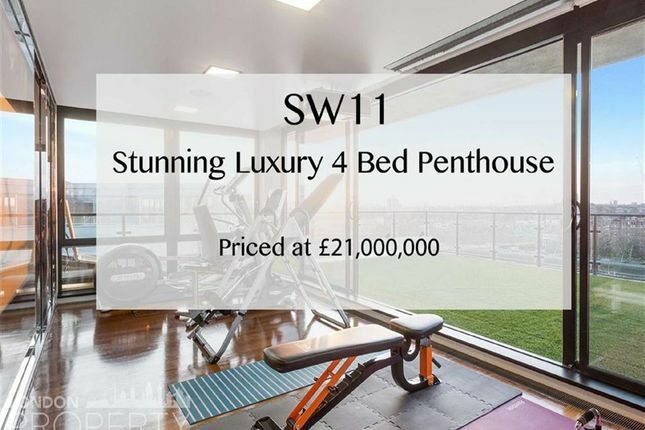 Located on the second floor of the apartment, we have something here that is almost completely unseen on the London sales market. The apartment has its own swimming pool and pool room. The swimming pool is an infinity pool, that ensure that you are able to swim continuously. Glass surrounds the majority of this room and has a stunning glass roof that fills the entire room with natural light. The gym room is situated between the pool room and the terrace area. Enclosed in a completely glass room, with sliding door out on to the terrace, there is no better place to knuckle down and work out. No luxury apartment with a pool and gym would be complete without its own massage/changing room and there is no exception here. Set just next to the pool room, complete with shower and sink, this room is a great space to unwind after a work out or swim. Located towards the rear of the top floor, no luxury has been spared as we have a sauna here too. Finishing off the leisure and fitness features of this phenomenal floor of this apartment we have a steam room situated across the hall from the sauna room. Located at the back of the apartment on the second floor, we have a staff room that has a handful of amenities that would be needed to make sure that section of the apartment is able to be maintained to the highest standard. Next to the the staff room we have the apartments plant room that houses all of the large equipment including the boiler. Next to the staff room we have the utility room, fitted with all the necessary appliances. The top floor terrace, adorned with artificial grass, has a fantastic and uninterrupted view of the River Thames, you are also greeted by a wonderful city skyline and panoramic views. Sights that can be enjoyed both day and night can be found from up here. LondonPropertyGuru endeavour to maintain accurate depictions of properties in Virtual Tours, Floor Plans and descriptions, however, these are intended only as a guide and purchasers must satisfy themselves by personal inspection. Property descriptions and related information displayed on this page, with the exclusion of Running Costs data, are marketing materials provided by London Property Guru, and do not constitute property particulars. Please contact London Property Guru for full details and further information. The Running Costs data displayed on this page are provided by PrimeLocation to give an indication of potential running costs based on various data sources. PrimeLocation does not warrant or accept any responsibility for the accuracy or completeness of the property descriptions, related information or Running Costs data provided here.